9 Heads Fashion Notebook - Women's or Men's Fashion by Nancy Riegelman is the perfect outlet for designers everywhere striving to illustrate a collection of 'flats' involving women's garments and accessories. 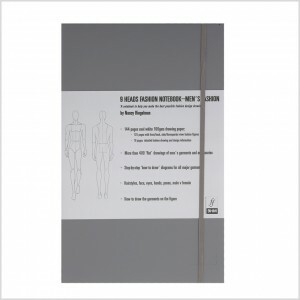 With 144 pages of drawing paper divided up into 125 pages of front and back view 9 head fashion figures as well as 19 pages of detailed fashion drawings and design information, this notebook can serve as both a learning device as well as a product development institution. Providing 400 'flat' drawings of women's garments and accessories, step-by-step 'how to draw' diagrams for complex designs, hairstyles, 's curve' variations, three-quarter and side view croquis, etc., Nancy Riegelman has truly put together everything you may need to know in terms of women's fashion 'flats'. 9 Heads Fashion Notebook is an attractive, indispensable companion for all who design and draw fashion.